An Ariane 5 lifted off tonight from Europe's Spaceport in Kourou, French Guiana, and delivered two telecom satellites into their planned orbits. The launch of flight VA225 occurred on 20 August at 20:34 GMT (22:34 CEST, 17:34 local time). Eutelsat-8 West B, with a mass of 5782 kg and mounted in the upper position atop Ariane's Sylda dual-payload carrier, was the first to be released about 28 minutes into the mission. Following a series of burns controlled by Ariane's computer, the Sylda structure encasing the 3300 kg Intelsat-34 was then jettisoned. Intelsat-34 was released into its own transfer orbit about 13 minutes after the first satellite. Eutelsat-8 West B, owned and operated by Eutelsat, will operate from 8°W in geostationary orbit. It will provide HD and Ultra HD direct-to-home TV broadcast services to the Middle East and North Africa, and telecommunications services in Africa and the eastern part of South America. The satellite has a design life of about 15 years. Intelsat-34, owned and operated by Intelsat, will be positioned at 304.5°E in geostationary orbit to provide media distribution services for Latin America and host a leading Brazilian direct-to-home platform. It will also support advanced broadband services to maritime and aeronautical providers serving the North Atlantic. It has a design life of 15 years. The payload mass for this launch was 9912 kg. The satellites totalled about 9082 kg, with payload adapters and carrying structures making up the rest. 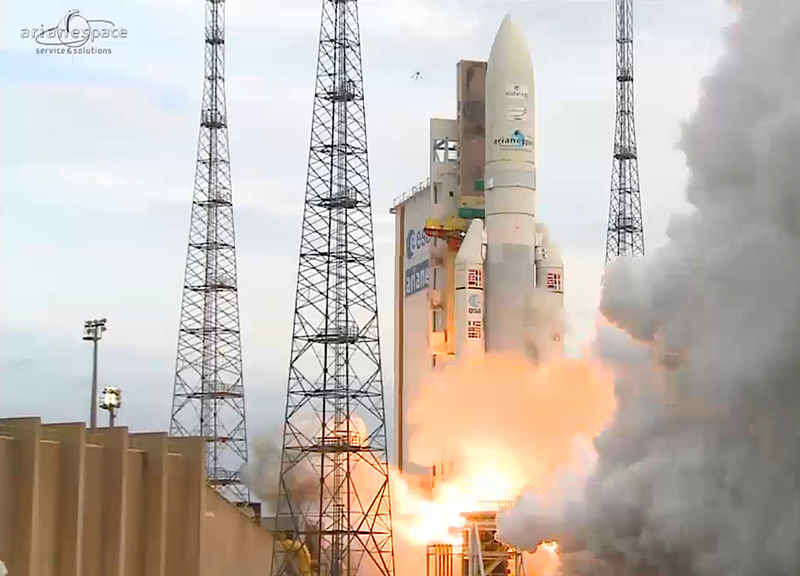 Flight VA225 was the 81st Ariane 5 mission.